NFC technology is gaining importance and its use is expected to increase significantly this year. It is a high frequency wireless communication technology, which allows the exchange of data between devices in close proximity. This technology has many applications, including the one we present today. Sometimes, launching an app requires a multi-step process, and for the ones we use on a daily base, it will be very useful to have a button that launch this app directly. 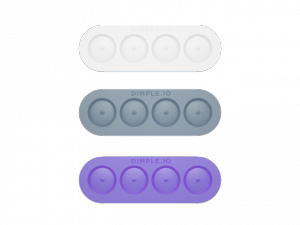 The Dimple is a small sticker that attaches to our mobile device and allows us to configure the functions of the buttons. It can have 2 or 4 buttons, depending on the model, and it is used to launch applications, change settings or activate the flashlight, among other things. Furthermore, we can double the number of buttons by assigning different functions depending on the way we press the button, either with a short or a long press. Also, being able to stick it where we want, we can fully customize our device, placing the buttons in the most convenient location for us. If you find it interesting, there is an ongoing campaign on Indiegogo to raise some funds. It began with the goal of raising $ 43,000, and currently, 12 days before it ends, the campaign has gathered $ 67,489. If we want to contribute, for $ 17 we can get one of the first units with two buttons manufactured, whereas for $ 27 we will get a standard one with four buttons. The device is currently in production, and the first units will be sent to all the contributors in the campaign starting on August . 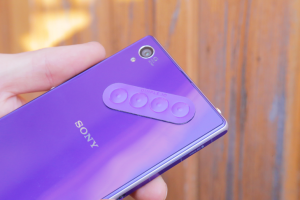 The company is already working on a second version with some improvements over the current sticker, and it is scheduled to hit the market by the end of this year. The Dimple is compatible with devices running Android 4.0 or higher with NFC connectivity and without a metal body. This excludes, for example the HTC One, since due to the metal body, the NFC antenna is located near the camera, which makes impossible to place the Dimple in an appropriate position. To function properly, we must stick it at no more than 2 inches from the NFC antenna. This is usually not a problem in smartphones, but with a tablet we must be sure that we put it in the right place. The Dimple is waterproof and the adhesives can be used several times. Furthermore, using NFC technology, it consumes almost no battery. It was originally available in three colors: white, gray and violet. Al exceeded $ 45,000 on the campaign, 3 additional colors were added: black, blue and red, and the list can be extended further. As an additional objective, the company has also introduced the possibility of manufacturing full covers with buttons, so that it could overcome the limitation on the devices with a metal body.